Let's Get Out Of Here! : Project Terrible: Golden Needles! A year after they each had separate cinematic success, Joe Don Baker – coming off Walking Tall – and director Robert Clouse – who’d directed Enter the Dragon - joined forces for this martial arts actioner. The story has various factions going after a priceless Asian statue that holds very special acupuncture needles – needles that legendarily grant eternal life to the person they’re shoved into. The bad guy side starts right off showing why they’re the villains when they send firesuited thugs out with flamethrowers - which really burns some people up. Elizabeth Ashley is hired to transport the statue, but she is quickly scared off . She in turns brings in beefy adventurer Joe Don Baker to assist, with a cut of the profits and a generous slice of Ms. Ashley his prize. He drafts old pal Jim Kelly to provide some kung foomph,, and the trio sets out on a quest to find the now missing statue and deliver it to Ms. Ashley’s employers. The baddies, led by a wonderfully campy Burgess Meredith, proceed to attack, chase, and battle Baker and Kelly every chance they get. "Needles" to say, it’s quite a ride. Were you ever so happy to see a huge pile of throw pillows in your life? Although assigned as a part of Project Terrible by Robert over at Gaming Creatively I have to admit this kind of movie is right up my alley (70’s action with known stars) so it was already in my Netflix queue. It’s not a classic by any means, but it’s well worth a watch for those so inclined. I’ve always enjoyed Joe Don Baker, and here he adds meaty martial arts to his box of tricks. It’s nice to see Jim Kelly in another decently budgeted movie, as he was headed for Al Adamson oblivion a few years later. Elizabeth Ashley turns in solid work in a tricky role, but the acting kudos go to Meredith, who is marvelously menacing going over the top as the kind of guy who doesn't care who he has to order killed as long as he gets what he wants. 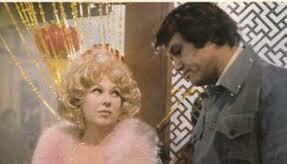 It's also nice to see Ann Sothern for a couple of minutes. This one is actually the best Project Terrible movie I've been given so far. Thanks, Robert! I like Elizabeth Ashley - but despite a couple of charming 70's outfits here - she isn't showcased well enough. Sorry, Ms. Ashley. 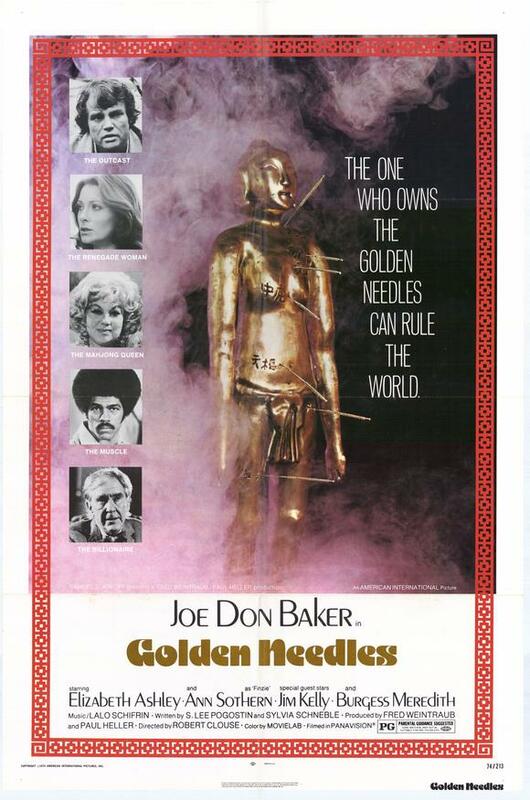 Buddha Man says "Golden Needles won't stick you with a bad movie." I think you would like it, Harry! It's unanimous then - when the fabled Horror Movie Diary/Melissa's Imaginarium/LGOOH Film Festival finally happens - this one is a must!